Please order a minimum of 3 sockets. 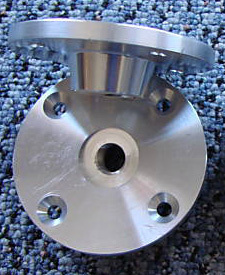 This socket will work on our standard legs that have a 1/2" diameter thread and #13 type thread. This socket attaches to the bottom of your lap steel and makes the leg angle out about 12 degrees, which is the best angle to make your lap steel stand up securely. See our listing for our great looking legs--ha! The sockets were made to match well with these adjustable legs and you can have your favorite lap steel standing up with the legs angled out for a sturdy base. The diameter is 2 15/16" at the base as it touches the steel guitar. I would suggest you get 4 stainless steel wood screws the correct length to mount the socket to the lap steel or your stand supporting the lap steel. The thickness of the base that rests on the surface of the lap steel or stand is 7/32" thick. This means you can mount the socket flush on the bottom of the lap steel or cut recess of 7/32" deep if you want the socket mounted with in a 2 15/16" diameter hole. The maximum diameter of the recess required into the lap steel is 1 1/4" diameter and 1/2" deep. This is to provide a recessed are for the leg to screw into the socket and give it great stability. The sockets are made of 6061 Aluminum. They may be easily buffed to a mirror shine. I suggest also buffing the heads of the stainless steel screws you purchase to hold the socket to the bottom of the lap steel or the bottom of the lap steel table you might build. The legs are naturally tilted outward about 12 degrees for stability when screwing into the socket mounting plate. We carry the highest quality steel guitar replacement legs that fit our sockets. See that listing for details.